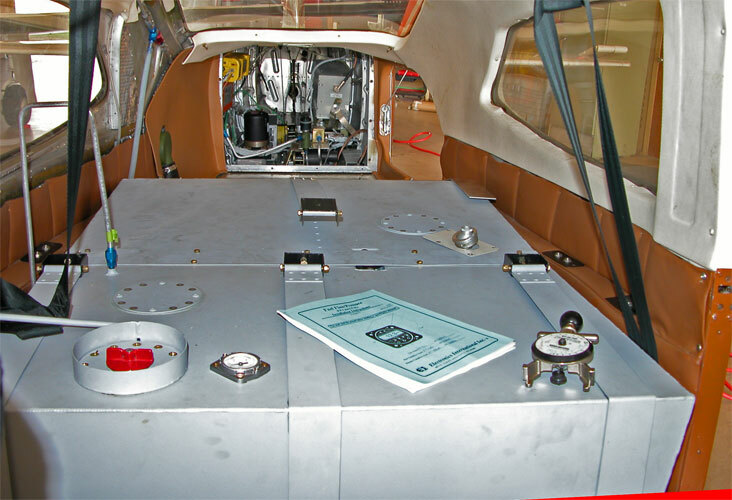 Outfitting the aircraft with cabin fuel tank. 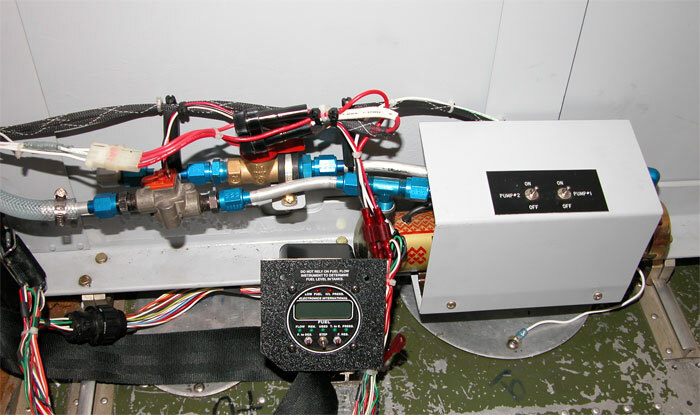 Fuel control unit with pumps, valves, flow transducer. Pump one and two are parallel redundant, or can transfer at a higher rate with both on. Fuel computer will keep track of how much is moved. Only the main wing tanks can feed fuel to the engine. All other tanks must be transferred with pumps to a main, then to the engine. The plane now has six tanks, five transfer pumps (and a spare). Need to get home from Hawaii, it's a long way. A view from the front of the airplane. Outside of a few odd items, you can see the filler cap, gauge, vent tube. The binding straps aren't attached yet, but they have specific torque loads for each bolt. The tank is assembled from two halves, and is welded aluminum. The transfer line is visible at left rear, it T's into an existing transfer line from the tank under the baggage compartment. Far rear is the tail compartment. HF radio tuner and amplifier, radar altimeter, 406 GPS ELT, autopilot, stormscope, sundries.